Day 1 depart from Nairobi at 7.30 am arriving in moshi at 4.00 pm dinner/overnight. Day 2 transfer to machame gate 1 hour drive. From the gate walk to machame hut 3000m 5 hours through rain forest,10 km walk dinner/overnight. Day 3 early in the morning after breakfast proceed to shira hut 3840m 6 km 5-7 hours,dinner/overnight. Day 4 leave at 7.00 am to barranco hut 3950m,5-7 hours walking,dinner/overnight. Day 5 leave at 7.00 am to barafu hut 4600m,8-9 hours walk,dinner/overnight. Day 6 This is the time of going to the summit.Leave at 11.00 at night through the srew,6-7 hours arriving at 7.30 am for the sunrise at UHURU PEAK 5896M.After taking photograph taking, descend to mweka hut 3100m,dinner/overnight. 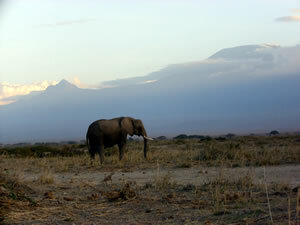 Day 8 transfer to Nairobi or tanzania safaris. Day 1 depart from Nairobi at 7.30 am arriving in moshi 4.00 pm, dinner and overnight at hotel and for a cclimatization. Day 2 after breakfast, depart through marangu village to marangu gate 45 km.an altitude of 1860 metres and hike 9km to mandara hut 2,744 metres. Dinner overnight. Day 3 after breakfast,leave to horombo hut which normally takes 7 to 8 hours walk dinner/overnight. Day 4 leave at 7.30 am to kimbo hut 4750 metres 8 to 9 hours walking,dinner/overnight. 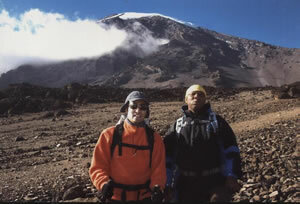 Day 5 leave to the summit at 11.30 at night,6 to 7 hours,arriving at UHURU PEAK 5,896M, arriving in the morning. After the sunrise descend down to kimbo hut for your full breakfast. After breakfast proceed down to horombo dinner/overnight. Day 6 leave at 7.30 am after breakfast and descend via mandara hut down to the gate and transfer back to arusha dinner/overnight. Day 7 transfer back to nairobi. A steady descent down through the moor land to Mandara Hut and then downward through the lush forest on a good path to the National Park gate at Marangu ( 1830m) taking 5 to 7 hours to be met and transferred to your Hotel for dinner and overnight. Umbwe route is the hardest but most magnificent and shortes way to reach Uhuru Peak. Additional days can be added to our programme to discover or lighten up along the route or camp in the Karanga valley. Day 1:: Arrival - transfer to hotel -dinner and overnight at the hotel. Day 2: After breakfast drive to Kilimanjaro National Park gate at Umbwe for starting the climb. From here hike within the forest through a narrow ridge between Umbwe and Lonzo rivers reachin Bivouac No. 1 (known as Forest Caves at 2850m - Camp and overnight. Day 3 The Path continues follwoing the ridge, then leaving the forest through open moorlands to reach Barranco Hut at 395m. Camp oand overnight. Day 6: The day is spent in descending down to the park Gates - Overnight at hotel. Day 7: Transfer to Airport or safari or the Coast.